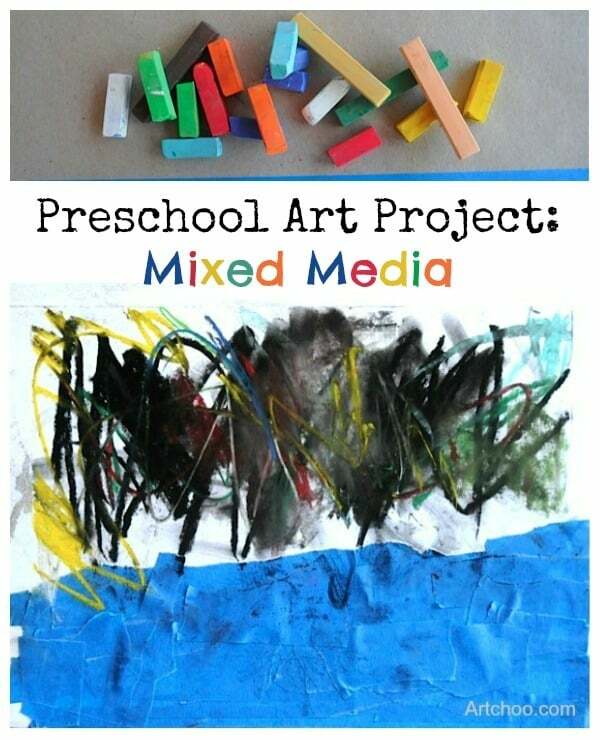 Here we are with a preschool art project- completely open-ended, really rather messy, and totally captivating. I pulled out some random materials and Beckett dictated what he would make, what my role was in the process (I was designated tape-ripper), and just how long he would stay interested in it. We love this weird blue painters’ tape. Come to think of it, tape is an all-around great art material isn’t it? I just realized I posted a duct tape idea last week, and a masking tape project the week before. Hmm. Maybe next week we’ll get all arty with clear tape? So here’s how it all went down. First he applied the tape. I had a hard time ripping pieces off fast enough for him, but finally he had had enough tape and grabbed some black charcoal. I have such fond memories of college figure drawing classes every time I see black charcoal…. Now. 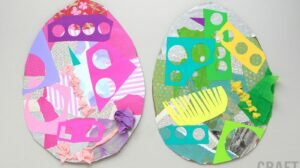 If you have kids, or work with kids, you know that they LOVE to grind their art material as hard as they can into the paper, attempting to leave the most concentrated pile of whatever they are using. Charcoal gives you this effect so easily, and is so satisfyingly black on the paper. Beckett ground that stuff into the paper until he just had a little nub left, and then he went in with his hands. Sweet. Beckett is so talented. I love his mixed media piece! You are putting it in a frame, right? Any ideas how to get kids interested in art? 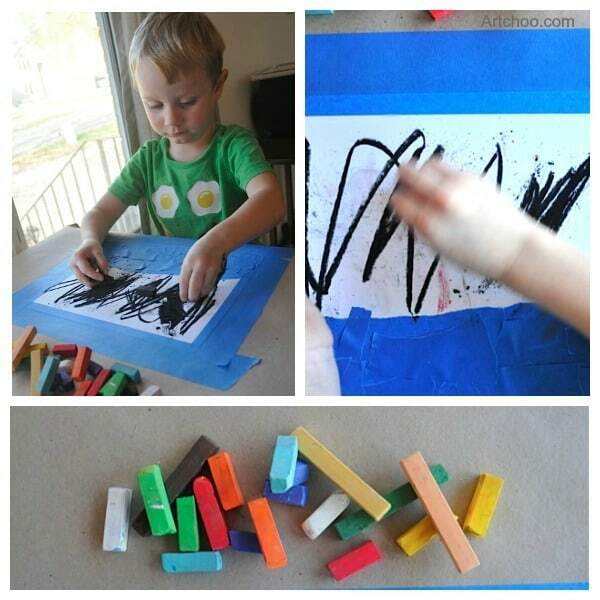 My son is almost 4 and his interest lasts maybe a minute in any craft project. I haven’t seen him initiate “art” even though the supplies are readily available at his level. We do projects together but I end up making most of the project while he watches. I truly feel like I let it be an organic experience for him and don’t try to control anything. We have his work displayed throughout the house. Maybe he just doesn’t feel it? But, any tips would be helpful. Thanks! Hey Robin! I think first off is to not stress about it, because he’s probably more interested in exploring other things at this point if he’s not actively pursuing making some art. He’ll come around- I don;t think there’s a kid alive who doesn’t gravitate toward art at some point. 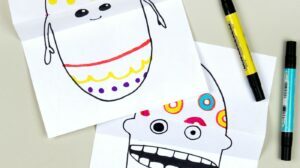 Also, kids can be creative without using traditional art materials. Does he like to play with playdough or build with blocks? He’s still accessing his creativity while he does these things. My son never spent that long on any art projects until he was into his 4th year either; it was only really in the last 6 months that he gets into an art project for any length of time. Does this help at all? Jeanette! This is awesome! I have to say I had the same experience with my LO… It just kinda happened. We ordered some pastels & i just “left them out” Came back & found her working away, grinding n grinding! For me its very exciting when my LO uses different materials becuz we’ve been working on gettin her to TRY new materials for about a month now. Thank you so much for sharing . I REALLY lovve your blog & the many new inspirations you offer us through your projects. 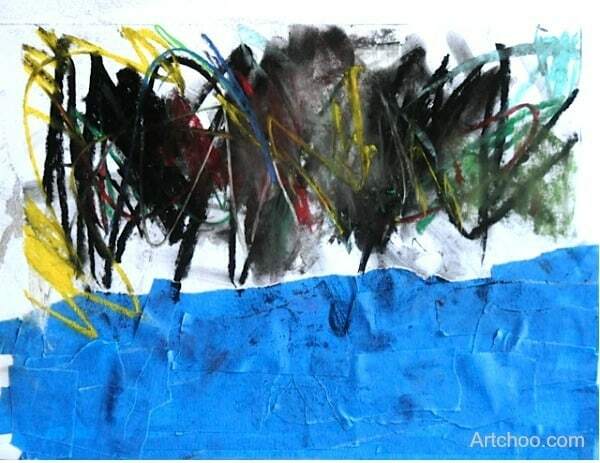 My FAV email is Artchoo, hands down!!! Thanks again!